Chief Cliff volunteer firefighters practice ice rescue techniques in the Lake Mary Ronan area. 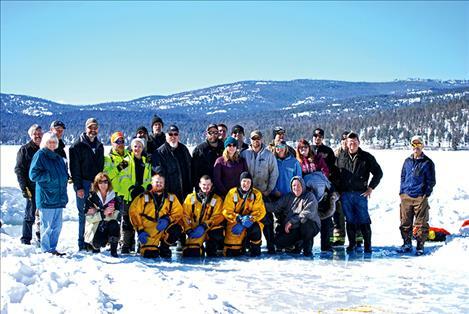 Chief Cliff firefighters were joined by Polson Rural firefighters for the March 3 ice rescue training. Firefighters are often the first responders to any local emergency, and from November through March those emergencies frequently take place on ice. 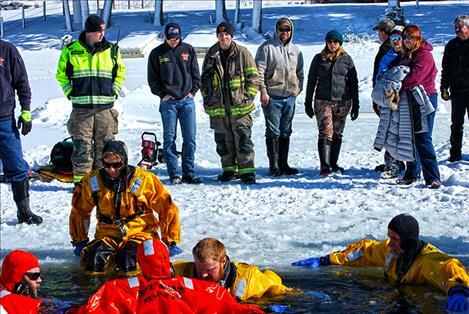 Whether called to respond to a wreck on an icy road, a slip and fall on a homeowner’s driveway, or a frigid dip in a half-frozen lake, firefighters are trained for emergencies and usually the first on the scene. 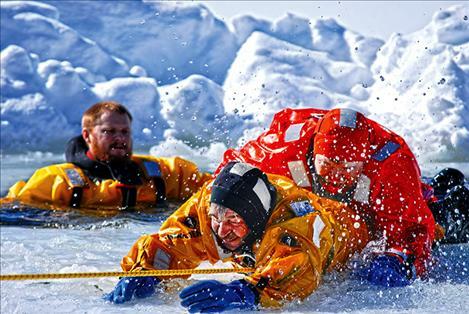 That’s why winter training—in frigid water capped with several inches of ice—is the best way to develop familiarity with the tools required for ice rescue and the skills needed to be successful. The Chief Cliff VFD/QRU has ice rescue dry suits for emergency use, and will be purchasing self-tapping ice anchors, and a premade harness from donated funds to enhance their ice rescue capabilities. Anyone interested in joining the CCVFD/QRU, or donating funds to assist with the various projects the fire department has in the works to benefit the Chief Cliff Fire Service Area, should contact Zoe at 406-849-5917.